Look close: these are people on top of the mesa. They are small. The rock is big. 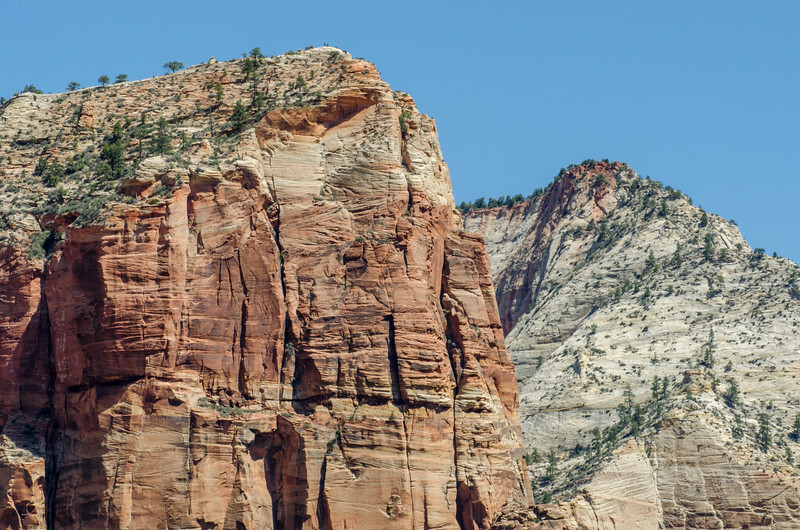 If you haven't been to Zion National Park, Angel's Landing is one of the premiere hikes in the park. It's also poopy-pants scary, requiring a hike up a very narrow and steep ridge with dropoffs of 1,400 feet or more. I made it about one-third of the way up in 2009 and literally sat down on the trail and started sucking my thumb. I have jumped out of a plane twice without too much fear. Of course, I was attached to a parachute -- on Angel's Landing, there isn't much more than a few chains to cling to. Kudos to those who make it. Maybe next time for me. As for the photo, I took this using my 70 to 300mm telephoto from the banks of the North Fork of the Virgin River near the Zion Lodge. I was surprised that I was actually able to see people. I could have cropped tigher but I like the big view that emphasizes how little people are in comparison to the surroundings. If you want to buy a print of this photo for a friend/spouse/family member who climbed Angel's Landing, I won't stop you. I do recommend the metallic paper, which makes colors really pop and sizzle. Any questions, just email me. Here's my portfolio and other work on my SmugMug page and feel free to follow me on Twitter; I think I'm up to four followers or something.